OK, so now we’ve got an official Democratic nominee. As the roll call vote unfolded, the State of New York stopped the voting and Sen. Hillary Clinton moved that they forego the vote and nominate Barack Obama by acclamation. The motion carried and Barack Obama became the party’s nominee. Tonight, Barack Obama will speak to a crowd at Invesco stadium as the party’s nominee. After this stupid-long campaign so far, it seems crazy to say it, but the general election is nearly underway. 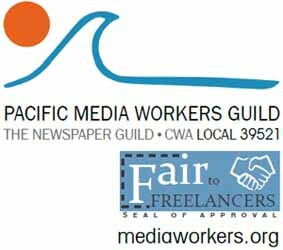 At least, in an official sense. Party nominations have become formalities in recent elections, tightly scripted and choreographed, without unpleasant surprises. So, for all intents and purposes, we have a Democratic presidential candidate, a Democratic running mate, a Republican presidential candidate, and a big ol’ honkin’ question mark. Who is McCain’s choice? Signs point to Lieberman, but signs can be (deliberately) misleading. First, there’s the fact that there’s a web ad out there, featuring McCain and Lieberman together — two smiling faces above the words “McCain: Join Our Team.” NYT columnist and founding neocon WIlliam Kristol wrote that McCain had his eye on Joementum. On the other hand, Bill Kristol is famous for being wrong on an extremely regular basis. So regular that close observers wonder how the hell he manages to find work as a pundit. This was a man who helped found an organization devoted to invading Iraq, so I guess his blowful political analysis should surprise no one. But there are other reasons to suspect Lieberman is the choice. Golly! Karl Rove must be really worried that it’ll be McCain-Lieberman ’08. If it’s true, Rove has reason to worry. See, no one likes Joe Lieberman. 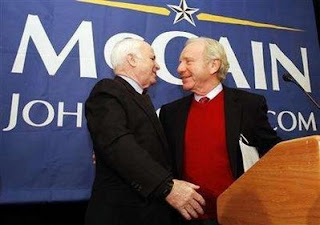 In his home state of Connecticut, Lieberman’s approval ratings are through the floor because of a combination of his support for John McCain and his relentless bullcrap in support of the occupation of Iraq. Lieberman scores a 45% approval, down from 52% in March — the first time he’s fallen below 50% in 14 years. If he were running for re-election today, it’s likely that he’d lose. Then again, when it comes to Connecticut, McCain literally has nothing to lose. He’ll be crushed by Obama there — polling 35%-56% in July. No choice he’ll make will make any difference there. Those electoral votes will not be McCain’s. Then there’s the idea that choosing Lieberman would help McCain with the Jewish vote. It wouldn’t. Only 37% of US Jews have a favorable opinion of Joe Lieberman. Barack Obama — that secret mooslum — scores better than that with US Jews. Fully 60% view him favorably. Finally, the base doesn’t like him because he’s pro-choice and everyone else in the GOP doesn’t trust him because he’s a proven turncoat. The only person who seems to actually like Joe Lieberman is Joe Lieberman. In short, he’d be an amazingly awful pick. So all of this talk about Lieberman may be a head-fake. The McCain campaign may be leaking Joementum hints to make any other choice look better. McCain could even claim — falsely — that Lieberman was the easy choice, the politically expedient selection, but that he put politics aside and put America first with whatever other awful choice he makes — compared to Joe Lieberman, even Mitt Romney would look good. McCain’s reportedly already made his choice, which he’ll announce tomorrow (or leak tonight during Obama’s address). I have deep, deep doubts — despite all the obvious hints — that it’ll be Joe Lieberman. Then again, I could be wrong. John McCain hasn’t been known for extremely wise choices in this campaign. If he wants to chain that anchor to his foot, you won’t hear me complaining about it. Comments for The Man Everyone Loves to Hate are now closed.